"Curb Appeal" doesn't get any better than this! This 3,050 Square Foot Home offers a full 1/3 Acre lot measured at 80'x180' (full sized lot plan in "More Information" section) on a beautiful "Golf Course Drive" set amongst similar styled high end homes. Located across the road from the Third hole of the Shuswap Lake Estates Golf Course, ownership of this home provides a His/Her Golf Membership at the course valued at $10,000! You will love the environment of the Golf Course Lifestyle as many neighbours will easily become friends with the many social activities offered in the area. Golf, Tennis, Hiking, Gardening, Boating, Swimming, Snow Mobiling; to just name a few! 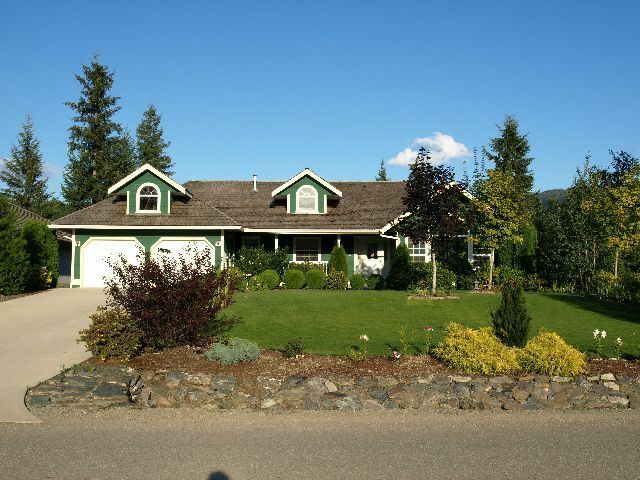 Enjoy the Golf Course lifestyle at Shuswap Lake Estates in Blind Bay with this home opposite the 3rd Hole! Beautiful 3050 SqFt, 3 Bdrm, 3 Bthrm Rancher w/Walk-out Bsmt that would Suite easily. Professionally Landscaped, Front Porch, Covered Eating Deck, Sundeck & Covered Patio! Rock retaining wall & garden at backyard. Huge Master with Spa-Like 4 piece ensuite bathroom. Includes all appliances & Blinds, Hardwood Floors, Vaulted Ceilings, Multi-Purpose lower walk-out level. You will enjoy the elegant feeling of this property while maintaining the quality of a "Home", from the wonderfully landscaped gardens to the large oversized country styled entry porch! Vaulted ceilings border the large curved glass windows in the living room and the gas fireplace with mantle and tile surround provide a perfect focul point that can also be enjoyed within the formal dining area. The kitchen offers custom oak cabinets, upgraded appliances, granite counter tops, eat-in dining area, a covered outdoor dining area and a huge sun drenched sundeck, which is also accessible from the Master Bedroom Suite. The Huge Master is at the far end of the home, providing privacy from the common areas. There is a large his/her walk-in closet and a "Spa-Like" ensuite bathroom with a jacuzzi soaker tub, walk-in oversized shower and make-up vanity. The main floor laundry room also offered upgraded appliances (all appliances are included) and provides access to the attached garage. The attached double garage has two overhead door with remote control door openers and three man door entrances, one off the front deck, one off the laundry room main floor and one onto the side yard; Quality Built In! The lower level also has two covered decks and is fully finished with a possibility for many functions. Currently being used as a partial shop, home office and home school area; this level would easily convert to a basement suite or mother-in-law suite. You will love the 5 different porch, deck and patio areas of this home. The rear yard is equally appealing with total privacy, and the large 1/3 acre lots provide plenty of distance between neighbours! You can find more Maps and Info in our "More Information" Section too!